Last April 18, 2014, I wanted to celebrate Choi's birthday uniquely, of course on a limited budget. Unlike other moms, I didn't have endless supply of dough. Of course, a meaningful, affordable celebration was what I had in mind. A Blessing For A Blessing. Since I believe that having my son is one of the best blessings God has bestowed upon me, I wanted to share his special day with less fortunate children. *Invitations - Free. I asked my friend to do an "e-vite" instead. Since it was a "friends and family" party, I just uploaded the e-vite on Facebook and tagged my friends. *Venue - FREE. 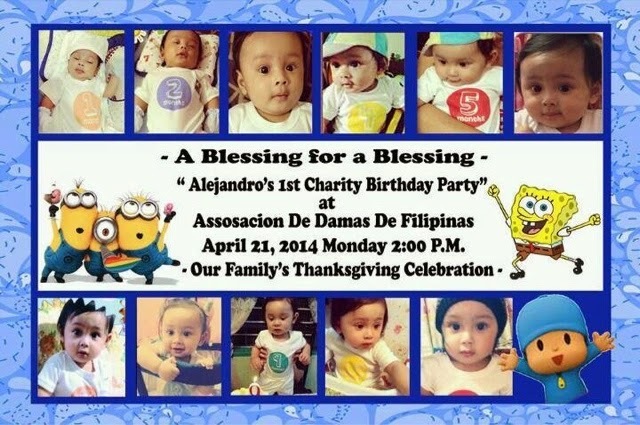 I have chosen to hold the event at Assosacion De Damas De Filipinas in Manila. They house orphaned children of about 50+. 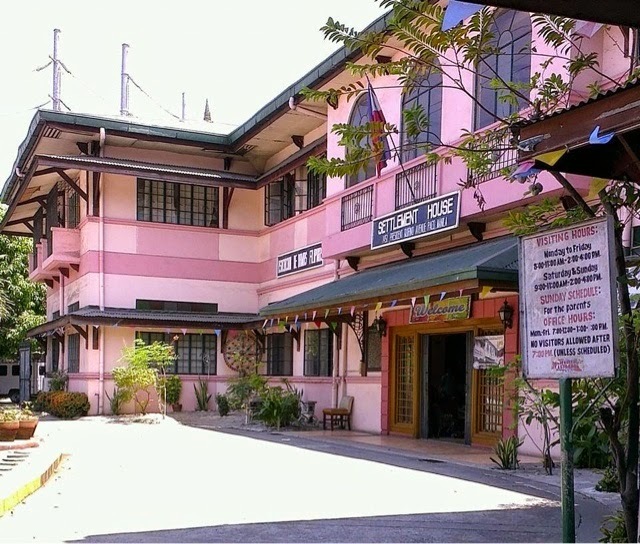 They are used to having people who celebrate special events there so they have a big hall to hold the party. You just need to make early reservations. *Decorations - I wanted to do the decorations myself, so I went to the Thrift Haven for party planners , Divisoria! *Candy Buffet - Of course, no party for kids would be a blast without a sweets buffet. Instead of hiring professionals, I created one myself. Once again, all materials except for the wooden letters were bought in Divi. *Cake - FREE. Lol! Once again, a gift from his godfather. Normally, a 12x12 Goldilocks square signature birthday cake costs around P719-P750. Check http://www.goldilocks.com.ph/products for the rest of their cakes and prices. Also check out http://www.divisoriaguide.com/ for all the best places to buy your party needs! That's me and choi at the candy buffet I set up for an added party fun. *Party Favors - I used the paper buckets, attached ribbons for handles and printed out choi's thank you for coming message as the party favor container. I put the excess candies and bought toys at Divisoria too. 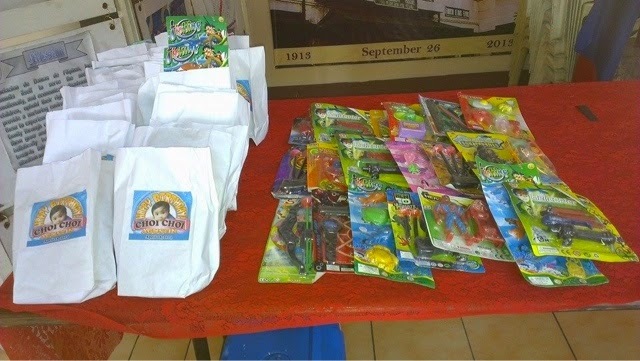 *Program, games and prizes- I bought about 150 pieces pf toys at Divi to be used as an extra party favor and the rest, I used as prize for the winners of the games. The program was facilitated by my friends called "Young Porks", bless them! *Mascots - Once again, Spongebob and Minion? Free! (another gift from his Ninong Jay). They didn't have Pocoyo though, Chois' favorite. Normally they charge around 6k - 7k for 2 mascots with 3 sets of performance. Contact me and I'll hook you up mommies! Lastly, I gave a little donation to the management of Damas to thank them for accomodating us. 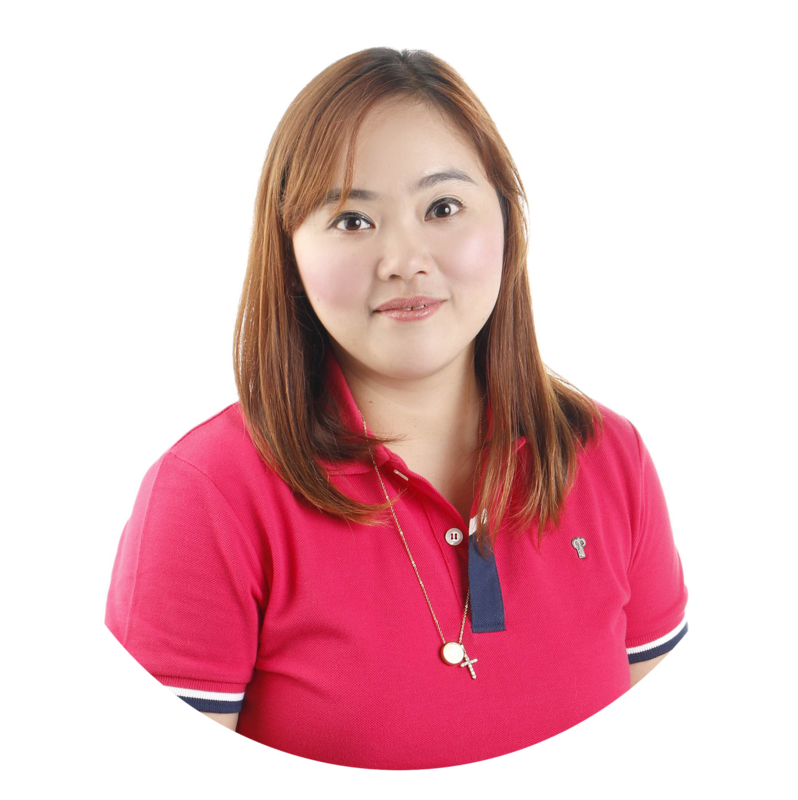 Total Party Cost: approximately P6000! (P5598 to be exact). The kids of Assosacion de Damas de Filipinas presented us with a song and dance number as a thank you for the event we dedicated to them too. I wanted to celebrate my sons' 1st birthday meaningfully but on a budget. Fortunately, that's what I got. 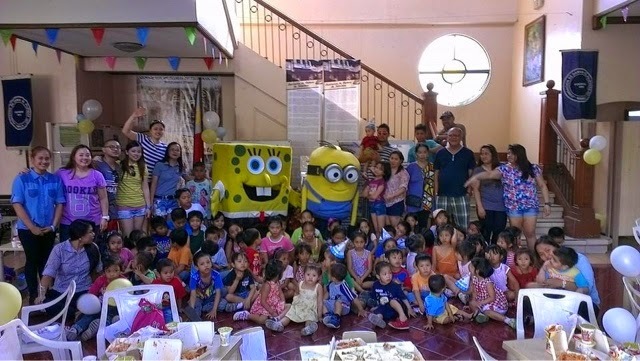 The smiles on those chidrens' faces will forever be the best party favor I had taken home from that experience. Kudos to you for celebrating the party in orphanage. I also buy stuff in Celebrations Party Central because Divisoria is too far from where I live. thanks mommy michi, they have a lot of nice stuff kase eh! This is a nice way to celebrate a party! Sharing your blessings to others is a rewarding experience! Wow, I think this is the best birthday idea ever. I have read so many birthday party ideas. They are all grand and beautiful. But none of them have ever thought of giving back while having fun at the same time. thanks mommy samantha! i love everything DIY! :-) i think it adds a little more personal touch. Awww, what a great way to celebrate a birthday! You are such a great mom! Belated Happy Birthday to your son. 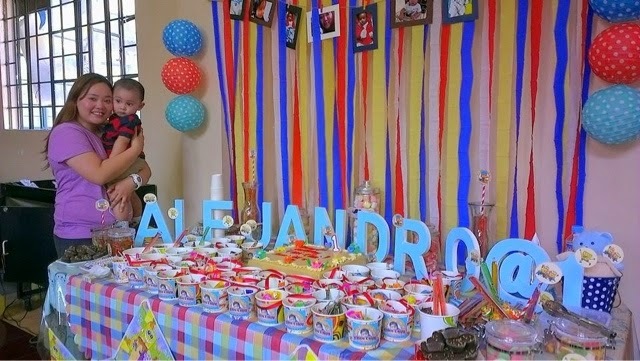 Wow, I admire you for thinking of doing this special kind of birthday celebration for your son. 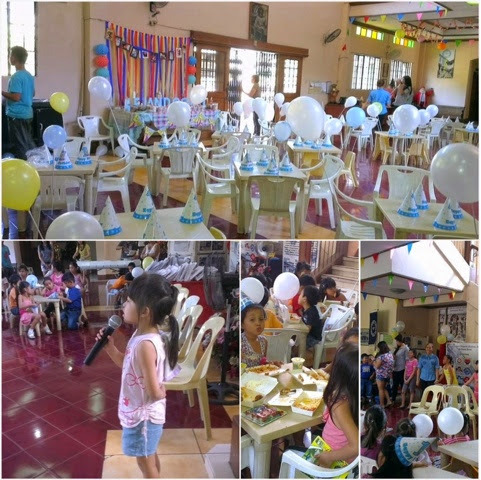 Some parents tend to go overboard with the party planning and end up spending thousands of pesos just for one day. This really is a more meaningful way to celebrate. hi, how much will it cost for spongebob mascot alone?